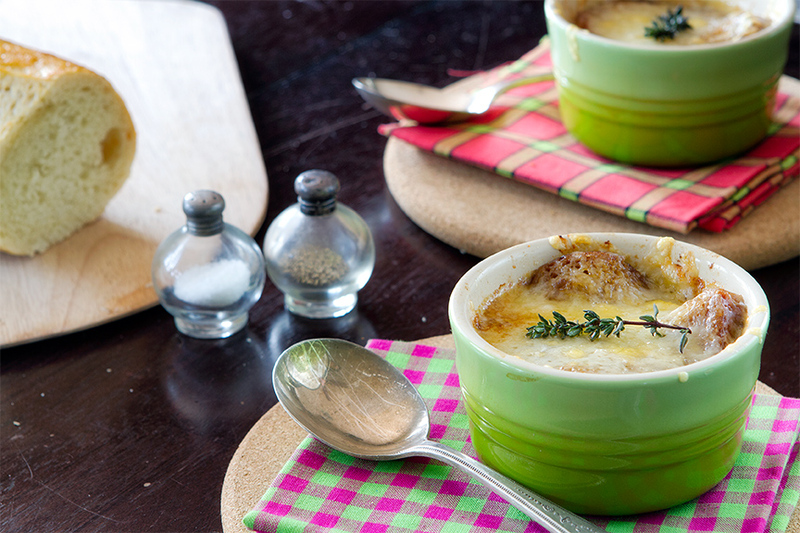 Get over your wintertime blues with French Onion Soup! – We Call Him Yes!Chef! 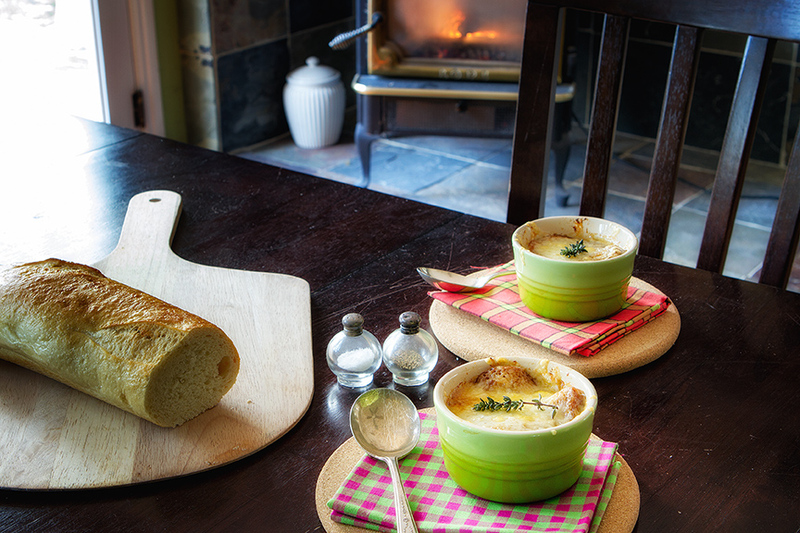 I think anyone who reads this blog knows how our family feels about home made soup. We love it. We even love soup in the summer as long as it is a cold soup like gazpacho. Many soups are also good for the waist-line (and every other body line, for that matter) and many people are concerned about their weight starting this new year…including me! Yes!Chef! said he could stand to lose a few pounds, too. 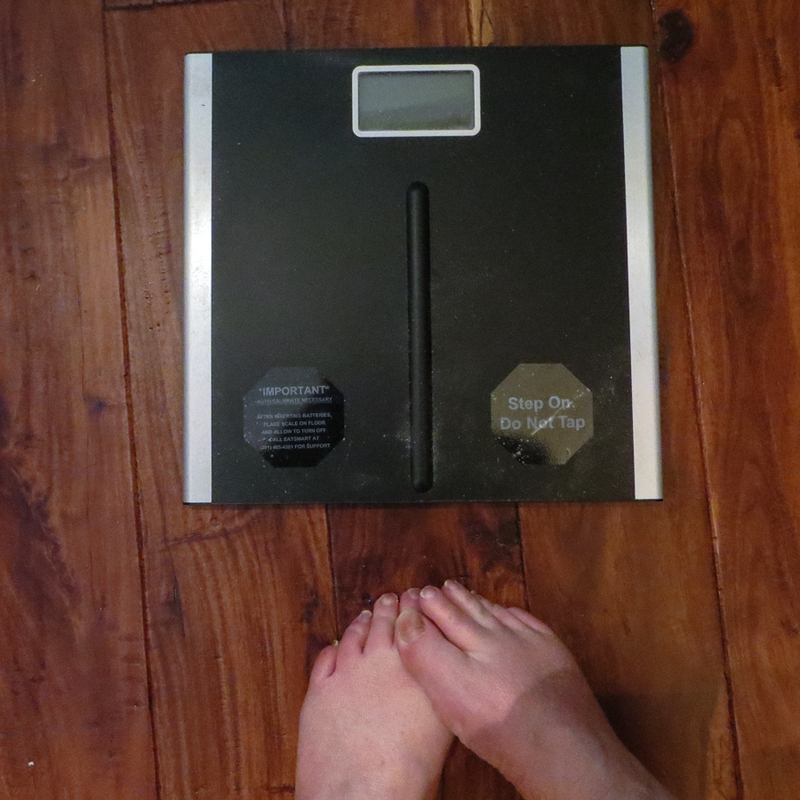 I was not very anxious to get on the scale but I managed to do it, which cemented in my mind that I needed to do something about this situation. So, I joined Weight Watchers. They have changed things up quite a bit since I participated in this program many years ago. For example: you no longer have to eat liver once a week. I am so relieved because I do not like liver. Not one little bit! I’ve also added a little exercise to my daily routine. And, Obie T. Dogg is quite happy that I’ve decided to walk much more. 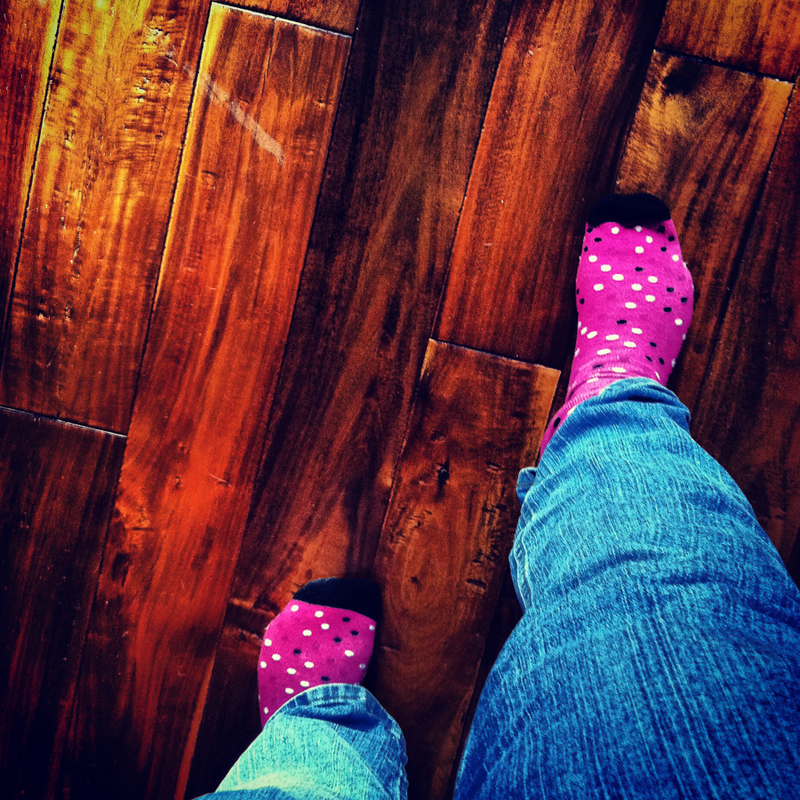 Except lately it’s been too cold to walk outside, so I just walk around the house. Yes!Chef! has been spending some time flying back and forth from here to New York to help out with insurance claims due to Hurricane Sandy (he’s an insurance adjuster by day). This last time he was able to go to Philadelphia. And, of course, while he was there he stopped for a Philly Cheese Steak. The last time we visited Philly was in 2000 and I think Y!C!’s been hankering for a good Philly Cheese Steak since then. You can see that the cart where he purchased the sandwich says it’s the best. He said the sandwich was darn good. 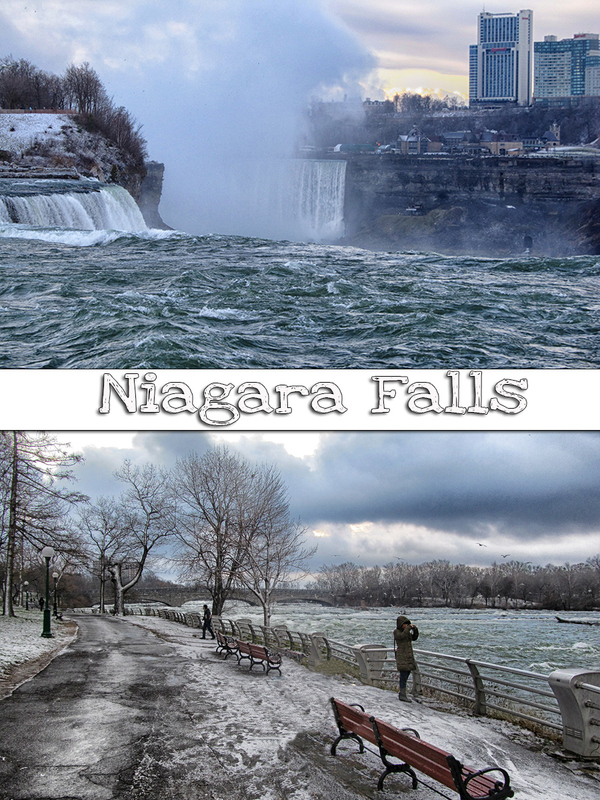 Right before Christmas he was in upstate New York and while he was there he visited Niagara Falls. It was pretty cold there, but the funny thing is how many people on the East Coast figure that California is one big beach. He said practically everyone he met, when they found out he was from California, chided him about the weather. They were quite surprised that our weather can be cold and snowy in the winter. We live in the Sierras near Lake Tahoe where it gets quite cold and frequently it was colder here than in New York. In fact, I think the last few days have been that way. Yesterday the temperature did not rise above 39 degrees and today wasn’t much warmer. Our bathroom pipes were frozen yesterday. At any rate, when Yes!Chef! returned from his last trip (gone for 11 days), he was very happy to be in the kitchen again. He made Roast Beef with Mashed Potatoes and Green Beans one night. 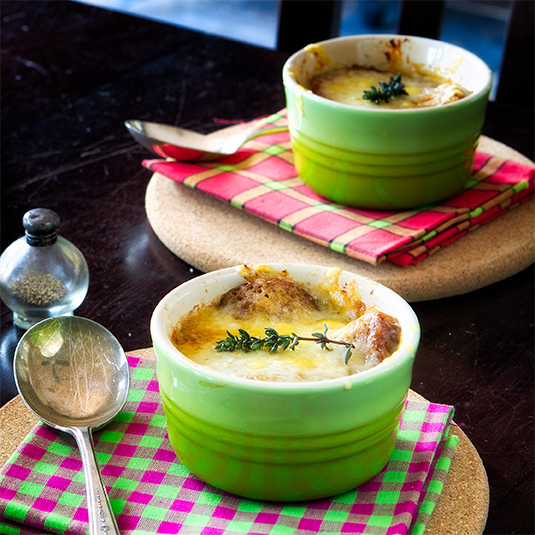 He made Roasted Lemon Chicken with white rice and Green Beans on another night and he made this French Onion Soup, which he placed in the refrigerator for a couple of days to age. We tried out the soup for the first time last night and it was quite tasty. We had it again for lunch today and it hit the spot. Y!C! 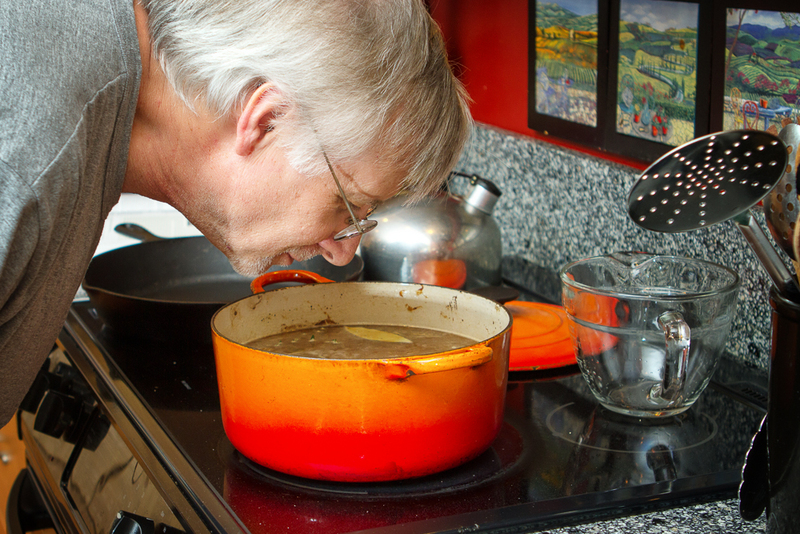 found the French Onion Soup recipe in a cookbook I gave him for his birthday, The Complete America’s Test Kitchen TV Show Cookbook. Have I mentioned that he loves America’s Test Kitchen? If you have never tried any of the recipes from this show, be prepared for a great tasting recipe but also be prepared for many steps in the process. 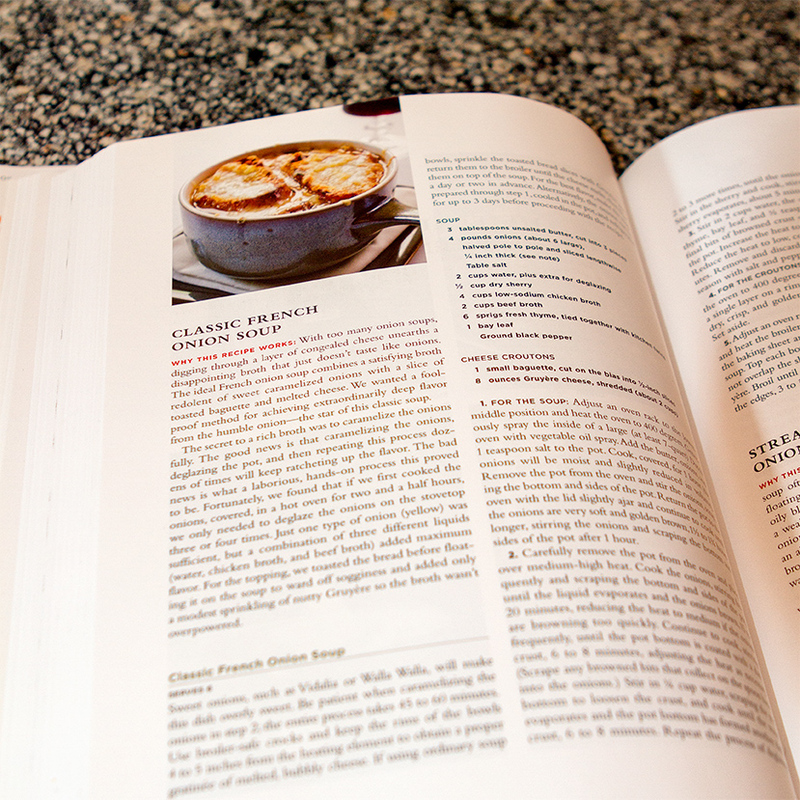 Also, if you like lots of big pictures in your cookbooks, this is not the book for you. There’s usually just one tiny picture above the recipe. Yes!Chef! has no concern about the pictures. He makes a recipe because it sounds tasty or it’s something he’s always wanted to cook or its a dish he wants to master and hasn’t liked some of the other recipes he has tried. Such was the case with French Onion Soup. The recipe called for regular Yellow Onions, not the Sweet kind. 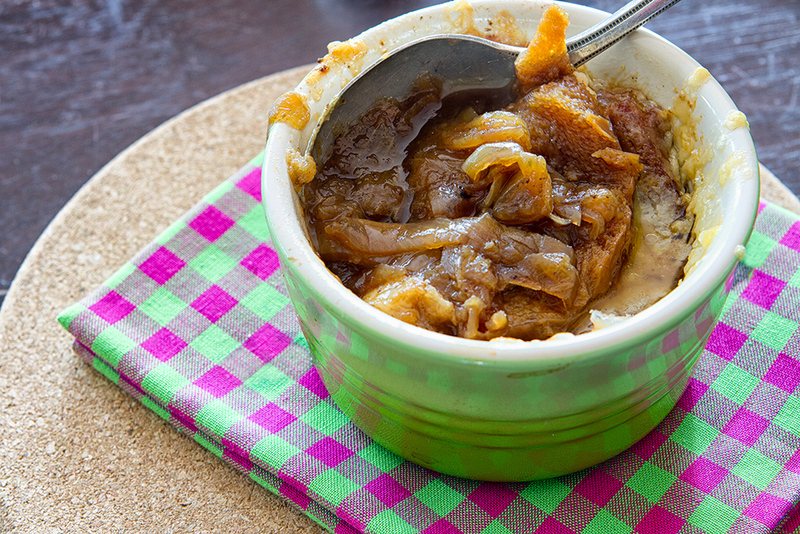 The reason they do not recommend the sweet onions is because the caramelization process brings out the natural sugar in the onions and the sweet onions would become too sweet and overpowering. I must say that the finished soup had a sweetness to it but it definitely had a true onion flavor. 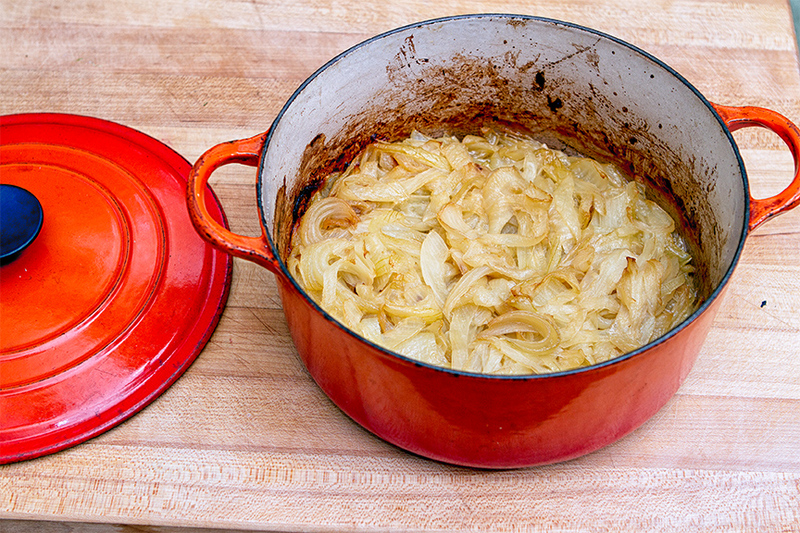 The first part of onion caramelization is to put the sliced onions into an oven safe pot and roast them for about 2 1/2 hours. After that you continue to caramelize on top of the stove. It’s a lengthy process to get the onions to the right stage, but there is so much deep and rich onion flavor that you will not mind the extra time. The rest of the recipe is easy. 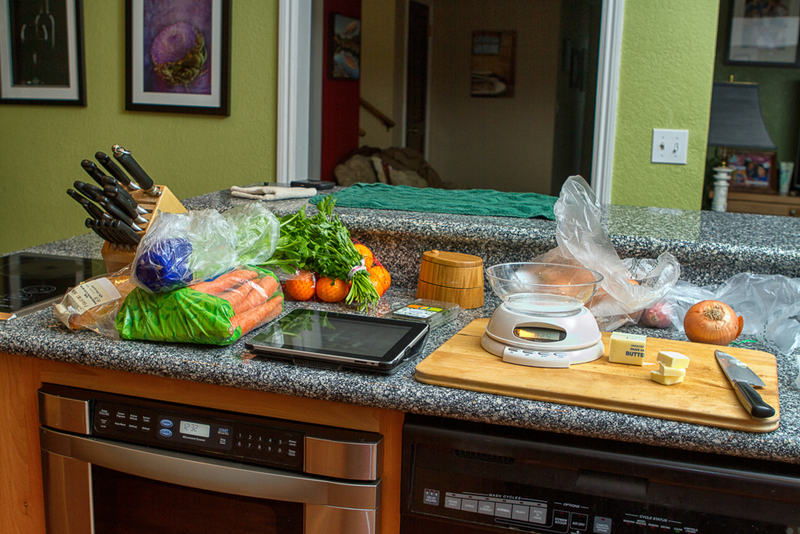 There are some really great pictures about this process on Americas Test Kitchen website. 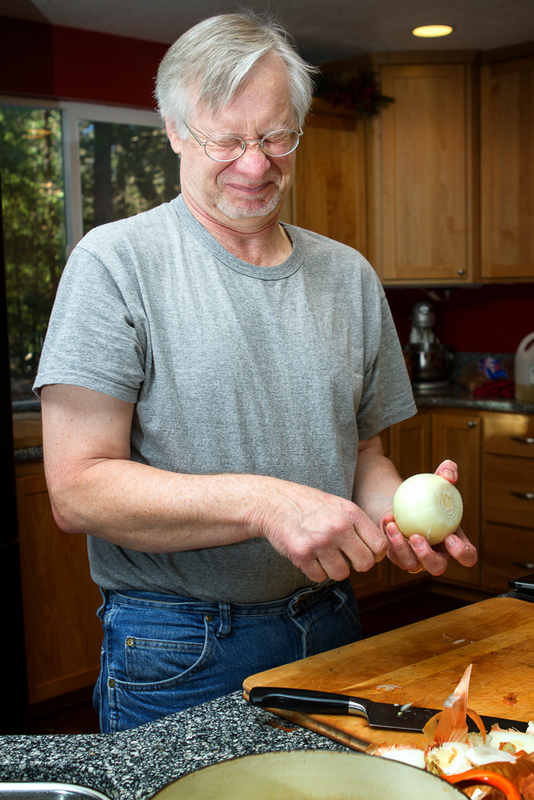 They are not, of course, as beautiful as my photos (smile), but they do illustrate how your onions should look. 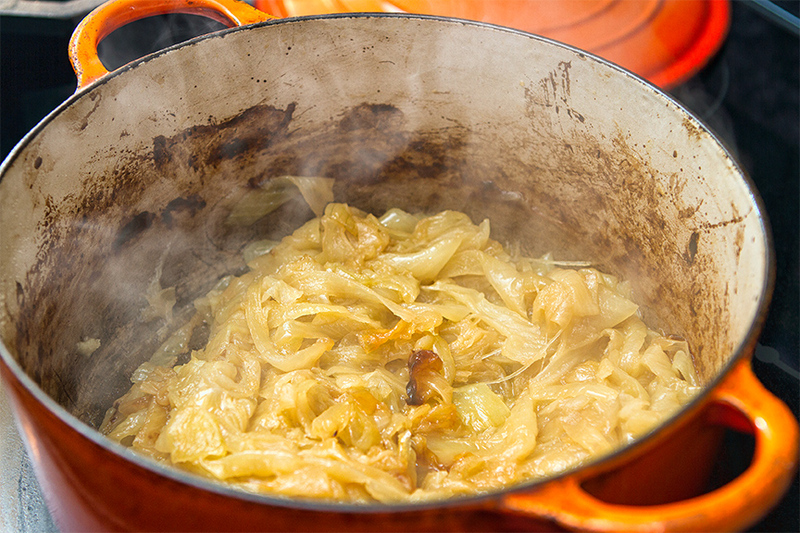 After you have finished caramelizing and deglazing, then just add the liquids and you are done. Make sure that you do not forget the lovely toasted baguettes that float on top of each individual serving with Gruyere cheese lovingly melted on the top.. It is such a warm and nourishing meal all by itself. Just add a simple salad and you are good to go. Who could resist this? Lift the cheesy top and golden brown onions magically appear. 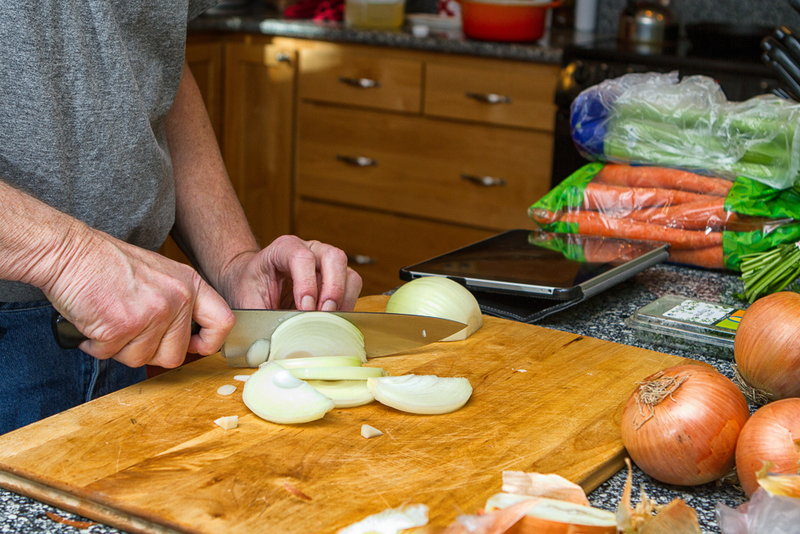 I am not going to write out the recipe because there is all sorts of good information on America’s Test Kitchen web page about the caramelization process, what types of onions to use and how to cut them. You will want to check out this wonderful website anyway. There is even a video on making this recipe. 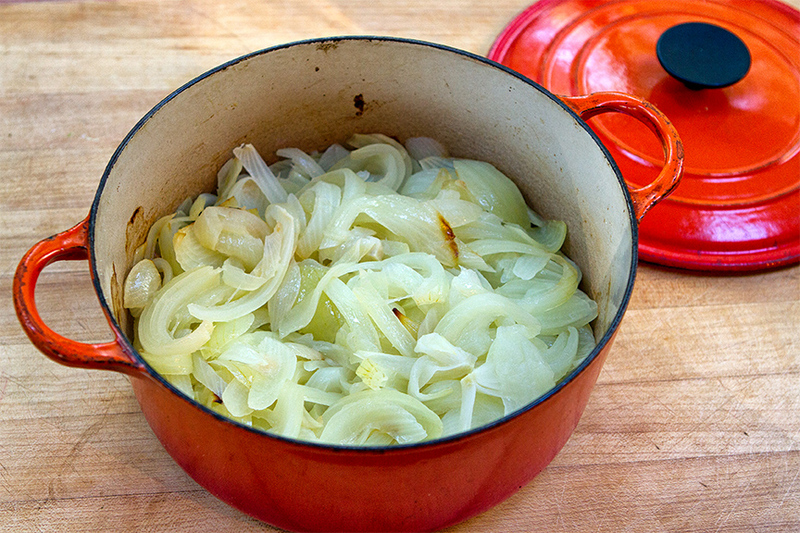 Go here for the recipe and detailed instructions on the caramelization of the onions. I really recommend this recipe if you are stuck inside on a cold weekend and have some time to make this luscious, warming soup. Looks delicious. 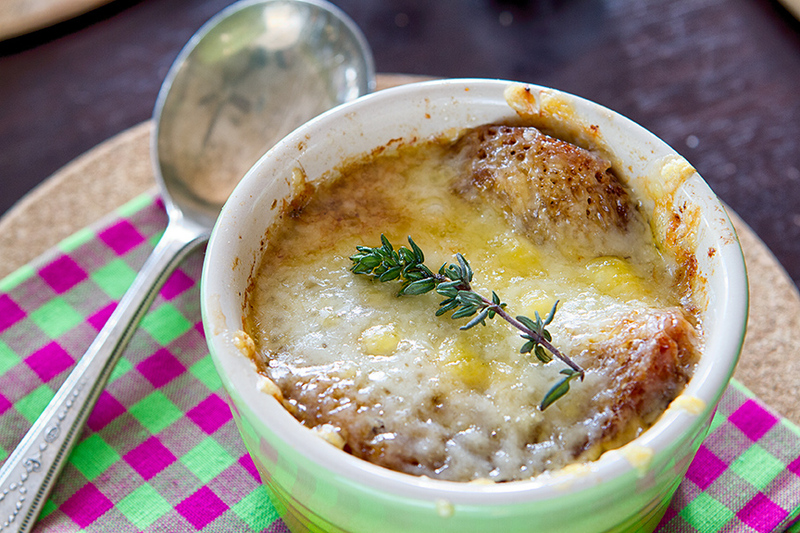 Nothing like a good French Onion Soup!!! And I’m from the Philly area….so I can understand giving into the temptation of a good Cheesesteak!! I think he might be considering a Philly CS recipe in the near future. He said the one he ate was quite good. I’d love to go there and try it myself. Beautiful place. When we lived in Paris when I was a teenager we went to Les Halles, which is where this dish was made popular. Les Halles is where all the fresh food comes into Paris and is purchased early in the morning, so on a chilly morning the soup is perfect to warm you up. Anyway, my Mom asked the chef what his “secret” was and at this particular “boite” (hole in the wall) he said he uses some leeks and used half beef broth and half chicken. That is so interesting because this recipe calls for both broths with more of it coming from the chicken broth. Y!C! says next time he would make it half and half…Leeks would probably also be good. Looks wonderful but I would not have the patience to do this without a big photo to look at in the cookbook! Its just another form of “Crow Photography”…you know about that, don’t you Karen? There are good photos of the process on the website but even though there is lots of time involved, most of it involves the onions being in the oven. The actual stove time is less than 1 hour where the cook is actively involved. Oh! and thanks for reminding me about my Crow Photography (I got distracted with the onion cooking process. Caw.) I need to get out and shoot. Tahoe is calling! The soup looks delicious. If there was smellblogger I think I could inhale that fragrance….. I have to say that I’m with Mary. I just don’t have the patience to go through so many steps, especially with no pictures. I’m just not a Chef! Sure wish I was or had my own private Yes Chef to make these spectacular dishes. I am one lucky woman, Sue. When Y!C! got home and started cooking the smells coming out of the kitchen put me just a little closer to heaven. Yes!Chef! would give you a thumbs up for your comment about their recipes ALWAYS working. He just loves their recipes. How exciting for Judy! We tried a couple of pressure cooker recipes a couple of months ago and I think we need practice.